Why Is There a Retirement Crisis? Baby boomers, or those born between 1946 and 1964, expect they’ll need $658,000 in their defined contribution plans by the time they retire, but the average in those employer-sponsored plans is $263,000, according to a survey of 900 investors by financial services firm Legg Mason. Older boomers, who are 65 to 74, have an average of $300,000. My take is that this is more of an expectations crisis than a retirement crisis. Many people are simply going to have to work longer, live on less, ratchet down their expectations for retirement or some combination of the three. It would have been nearly impossible to lose money over the long-term since the 1980s. Obviously, these figures don’t account for things like inflation, taxes, fees, behavioral issues, etc. but pretty much any reasonable investment you threw your money at over the past thirty-plus years would have seen impressive gains had you held on. Over the past 40 years, in what may go down as one of the best environments ever for financial assets, a conservative portfolio of 30% in stocks and 70% in bonds would have returned 9% or so per year. And you wouldn’t have had to earn 11% a year like the stock market or 7% a year like the bond market to grow a sizable nest egg. Simply sitting in cash, an asset that never shows a loss and has about a little volatility as you could ask for as an investor returned just shy of 4.5% since 1980. These are long-term returns that I’m guessing many investors would trade a limb for at the moment. As returns in the markets grew stronger throughout the 80s and into the 90s the savings rates continued to plunge. After a sharp rise following the financial crisis, it’s once again on the decline. If I had to point to one variable that could explain why so many are so ill-prepared for retirement it would be this. Obviously, there have been structural forces at play here including the widening gap between the haves and the have-nots and stagnant wages for a decent segment of the population. 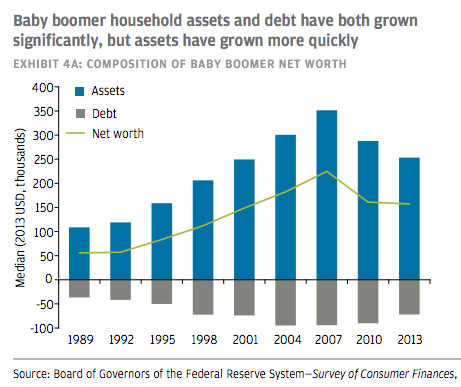 Still, there are many baby boomers who squandered the opportunity for large gains in financial assets because they didn’t have any money at stake. I’m sure most of those who are underprepared right now for retirement would tell you they wish they would have saved more money when they were younger. You could have the best investment strategy on the planet but it won’t help you if you don’t save money to take advantage. The best investment you can make is often saving more money. We can’t control what returns financial assets will have going forward but we can control how much money we set aside. With life spans, and thus investor time horizons, expanding, saving money for long periods of time to allow compound interest to do the heavy lifting for you will be more important than ever.